An architect friend just shared this beautiful film with me. The film, The Third and the Seventh, was directed by Alex Roman and combines cutting edge computer graphics with footage of existing buildings, including two of my favorite buildings — Santiago Calatrava’s Quadracci Pavilion and Mies van der Rohe’s 1929 Barcelona Pavilion. 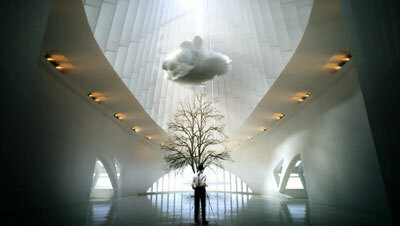 The result is both abstract and surreal. The original film is hosted by Vimeo. Sit back with a glass of wine and enjoy this is high definition. 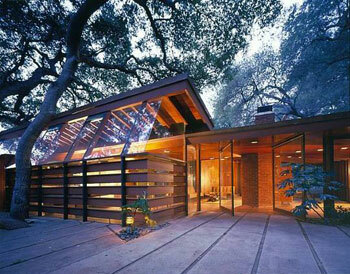 The Lautner House featured in "A Single Man"
Run, don’t walk to see Tom Ford‘s visual masterpiece, A Single Man. The styling and photography are breathtaking! In addition to the always fabulous Colin Firth, the other star of the film is the house Firth’s character, George, inhabits. I did a little online research and found out that the Schaffer House was designed by architect John Lautner in 1949 and is located at 527 Whiting Woods Rd., Glendale 91208 at the foot of the Verdugo Mountains. This completely restored redwood, glass and concrete building is currently on the market and can be yours for $1.5 Million. Additional photos from the Lautner foundation can be found here. We often put great architects on a pedestal and view visits to their buildings as pilgrimages… at least I do. While visiting my family in Philadelphia over the holidays I was able to view the work of architect Louis I. Kahn in a much more intimate setting. 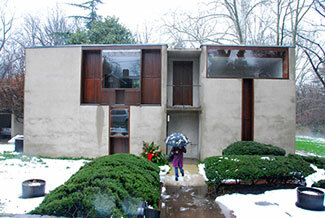 I had visited Kahn’s masterpiece — the Kimball Art Museum — in Dallas last spring. This time I was able to visit one of the few residential buildings he designed in Chestnut Hill, PA with a realtor at Eichler & Moffly. 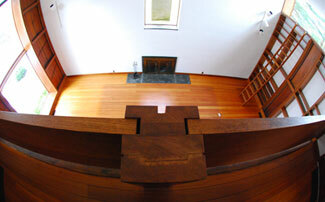 nature of the cabinetry is in definite contrast to the more linear geometry found in the rest of the house. We visited the house on a cloudy day, but I was still astonished by the wonderful open space and the natural light which filtered through the tall windows in the main living area and throughout the house. I was mesmerized by the richness of apitong wood used throughout and Kahn’s ability to provide a living space that was both intimate and spacious. This is only a modest one bedroom house but feels like much more. From the sale catalog: “Kahn’s principles of geometry, light and materiality are clearly expressedin the Esherick house, imbuing the intimate residence with a sense of monumentality. The material nature of the house—what it is and how it is made—is apparent at first glance: a private, contemplative building simply constructed of warm beige concrete and natural Apitong wood. 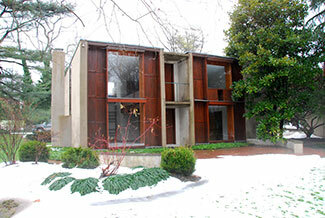 Clarity and tranquility characterize the whole of Kahn’s work, and the Esherick house (1959-1961) is no exception. Additional photos and floorplans can be found on the greatbuildings.com site. It was a treat to be able to visit the work of an architect of Kahn’s level on such an intimate scale and to see a building that is so well preserved. Rarely is the public able to access a private commission such as this… let alone purchase it! After spending time in this gem, I wish I had an extra $2.4 Million. I would move in tomorrow!